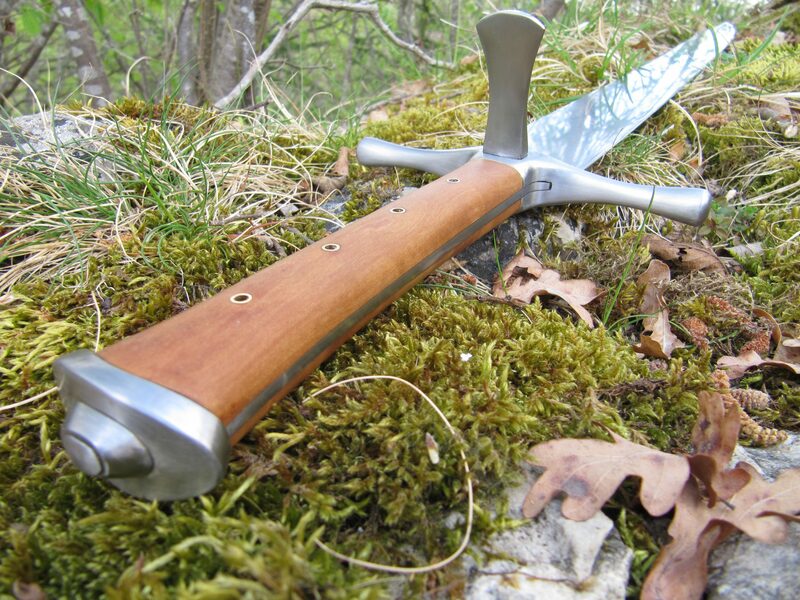 The Langes Messer was a very popular weapon in 15th century Germanic regions, due to its handiness often used as a sidearm and though nowadays often associated with people from lower classes of society, it was in fact carried by members of nobility as well. There are several surviving fencing manuals concerning the use of the Langes Messer and it is quite a popular weapon in modern HEMA. From a swordmaker‘s view, Messer are very interesting weapon dynamically. They are self-reliant in the way that they don‘t really need pommels, they balance themselves out largely by careful mass distribution in the blade and the (wide) tang. They also are quite complex to make and a lot of time is spent carefully fitting all parts together. As is obvious from the stats, this is a light and compact weapon. The Messer does have a good amount of blade presence but it never feels unwieldy. It flows and turns effortlessly through cuts and thrusts, with a pleasant forward pull in the hand, inviting to be moved. The point can be controlled easily and tracks well. By design, this weapon has every characteristic of a very capable cutter: a wide, thin and slightly curved blade with a long single bevel and acute edges. It is also a surprisingly good thruster. Because of its short length and the single-edged design with a blunt spine, the blade is quite stiff, despite its thinness. The clip point and sharpened false edge make for a very acute point that easily penetrates soft targets and allow for techniques that utilise the short edge, an important aspect of Messer fencing. While Messer probably were most common in civilian settings, they did also see use in military contexts. To reflect this and enable use against harder targets (armor for example) the point, though slender, is quite robust. 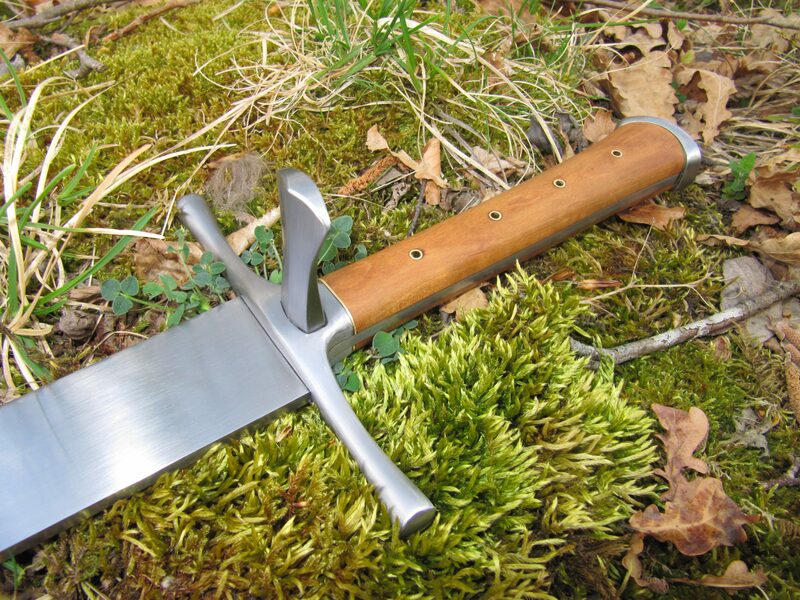 The hilt assembly is typical for Lange Messer, featuring a short guard, pierced by the Nagel, and scales riveted to the full tang. The pommel cap is peened over a peen block. 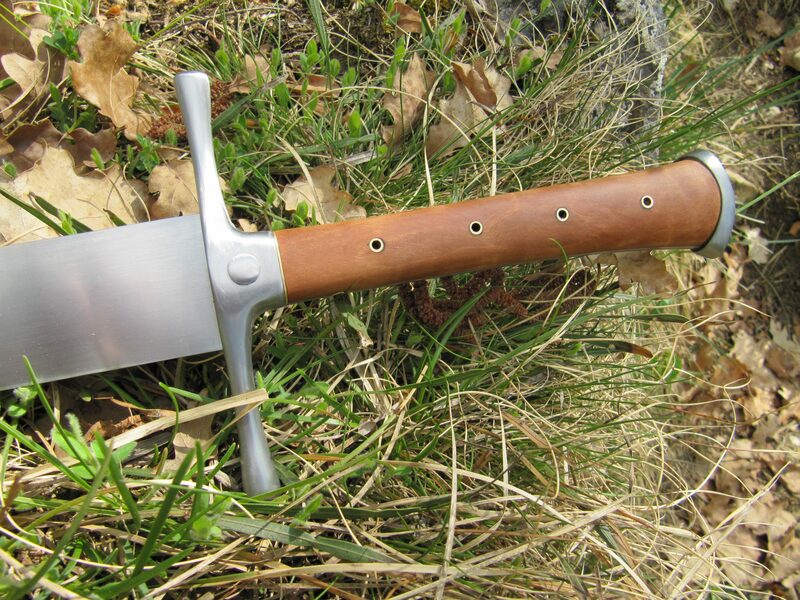 Overall one of the most secure and durable hilt constructions. Aesthetically, the Messer gives the impression of an unadorned, very much business-oriented piece of equipment. I had considered adding file-work but decided not to and let the in my eyes quite organic and flowing shapes speak for themselves, with slight accentuation by brass elements. 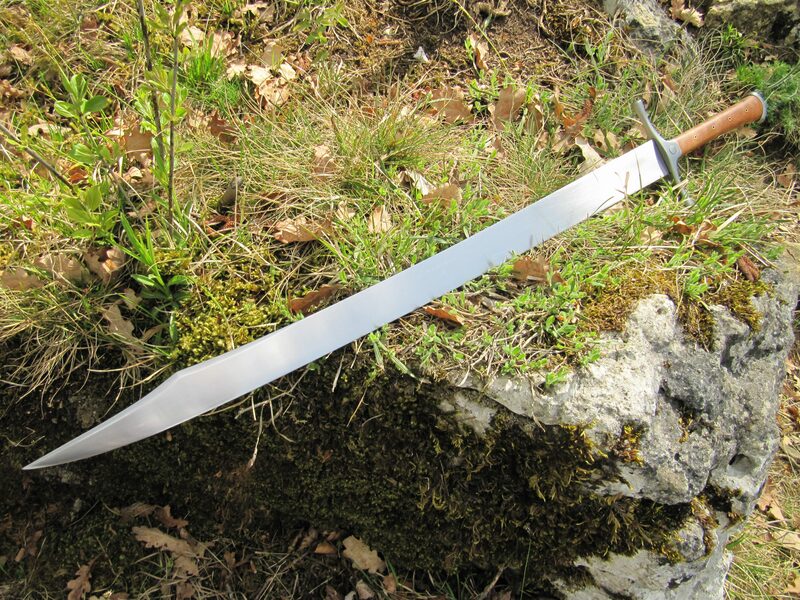 Messer, more than most other sword designs, have a certain viciousness to them. 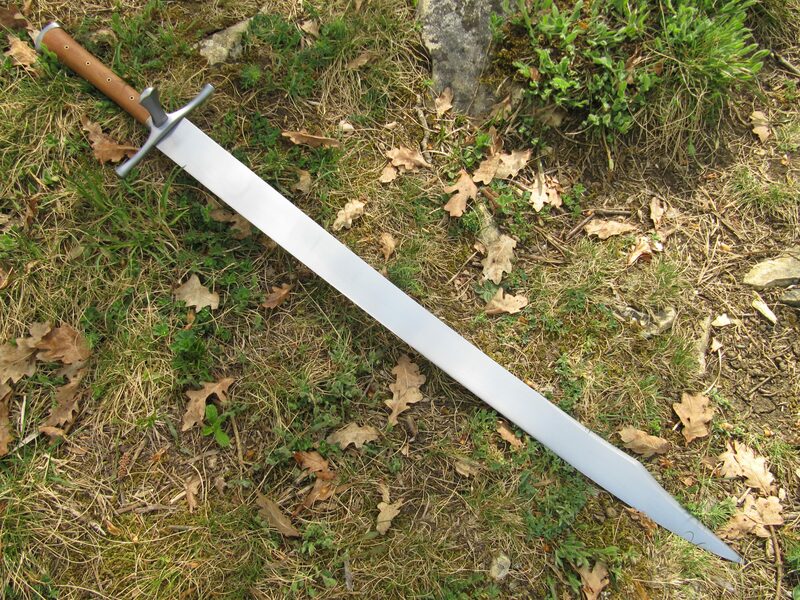 At least to my eyes… They are elegant, very thoughfully designed weapons but while a slender XVIIIb longsword manages to hide its martial purpose behind a slim, innocent seaming facade, the Messer cannot be mistaken for anything but a brutally efficient killing instrument. I might perhaps liken it to a big cat like a panther… even just harmlessly sitting somewhere, there always is a certain feeling of imminent danger.